Dumbbells are one of the most essential pieces of equipment for building a home gym. For most people, rubber hex dumbbells are the best choice. The hex shape means that the dumbbells won’t roll. The rubber prevents damage to your floor and also prevents rusting so the dumbbells last longer. 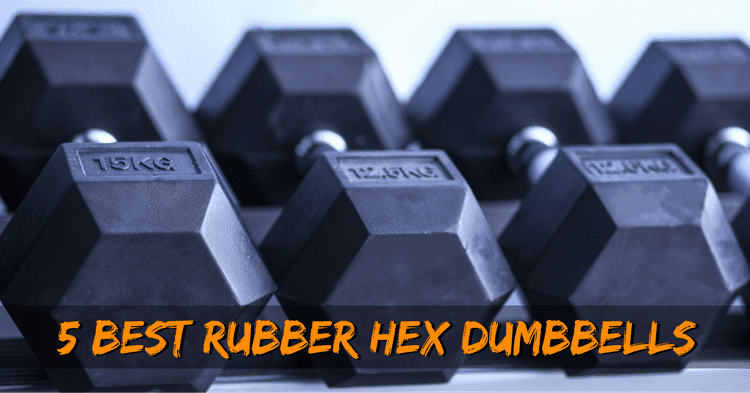 Why Do Rubber Hex Dumbbells Smell Bad? How to Care for Rubber Hex Dumbbells? The Best Rubber Hex Dumbbell? CAP brand is known for making quality but cheap hex dumbbells. They are made out of solid steel and have a rubber coating. The thing you need to know about these rubber hex dumbbells is that the shaft is wider than normal at 35mm. Also, they tend to stink a bit more than other rubber dumbbells. Who It’s For: Lifters with larger hands who need heavier dumbbells. Rubber is a bit greasy; some people report staining from the dumbbells when they were put on carpet! 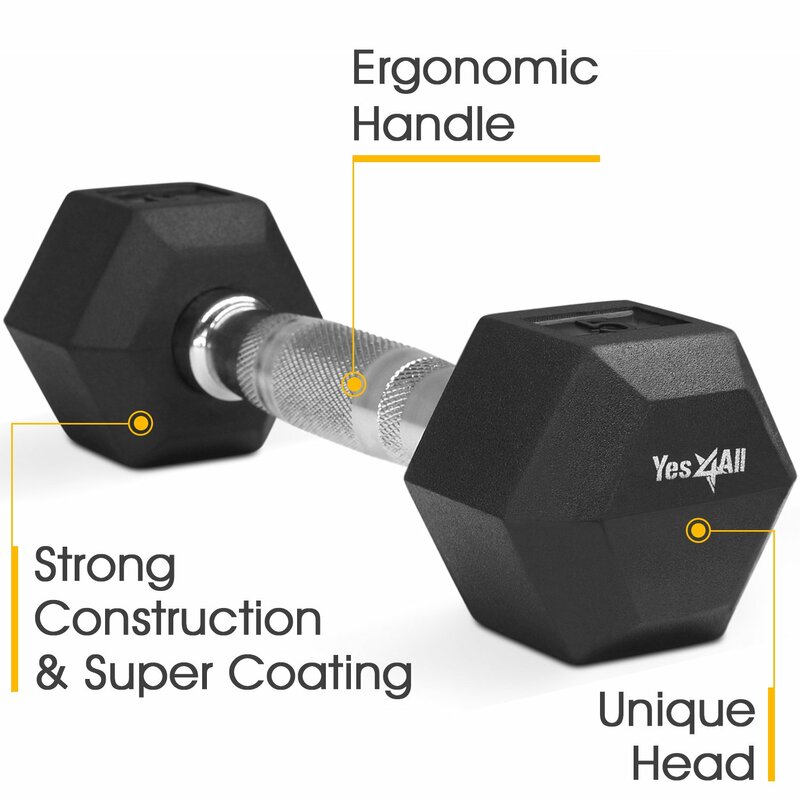 Yes4All is another brand making affordable rubber hex dumbbells that are still of good quality. One of the things that I really love about these dumbbells is that the shaft length is uniform across all the weights. Note, however, that the shaft size is larger (33mm vs. 28mm) for the heavier weights. This is normal but might bother people with smaller hands. Who It’s For: People who need quality hex dumbbells that won’t break the bank. These are actually octagonal dumbbells and not hex dumbbells. Some people prefer the octagonal shape because the corners aren’t as pointy and thus don’t hurt as much if they bang into you. However, others don’t like the octagonal shape because they can roll if you want to do dumbbell floor exercises like pushups. Note that all of the lighter SPRI rubber dumbbells are sold in pairs whereas the heavier weights are sold as singles. Who It’s For: People who prefer octagonal shaped dumbbells. 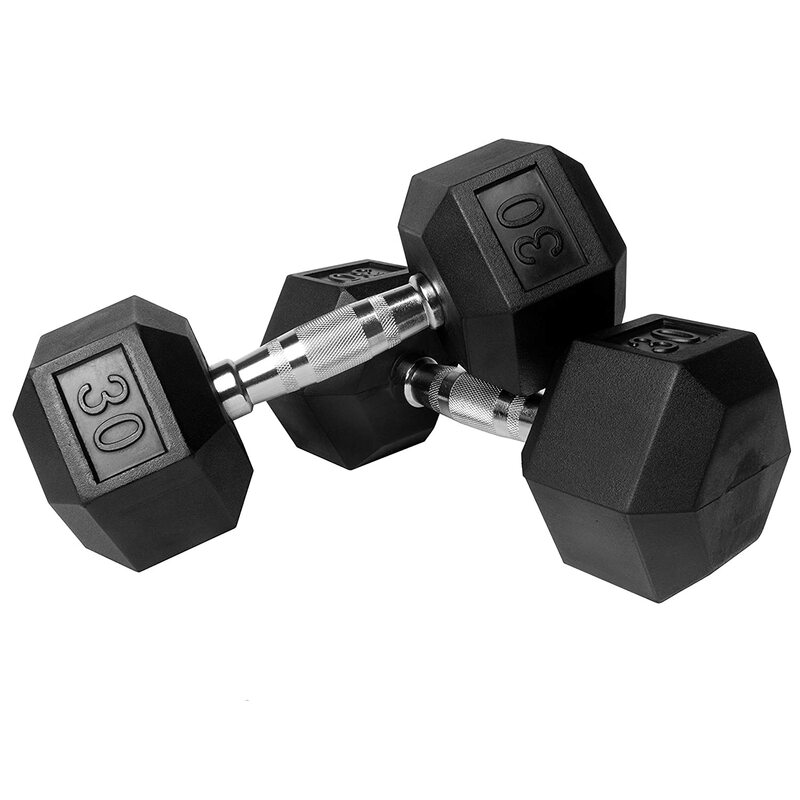 XMart rubber hex dumbbells are one of the better-quality options. 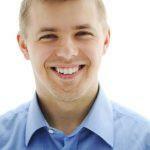 They have heads which are torque-threaded so they are less likely to crack at the handle joint. The handles are also very nicely made and give a good grip. Another nice perk of these rubber dumbbells is that they don’t stink nearly as bad as other ones, and the smell goes away quickly. However, expect to pay a bit more for the higher quality. The price isn’t too high though because XMark only ships dumbbells in pairs to reduce costs. Who It’s For: People who don’t mind paying a bit more for better quality rubber hex dumbbells. This is a complete set consisting of 10 dumbbells in pairs. Note that the product description is incorrect on this product! It says that the total weight is 75lbs. The actually total weight is 150lbs! 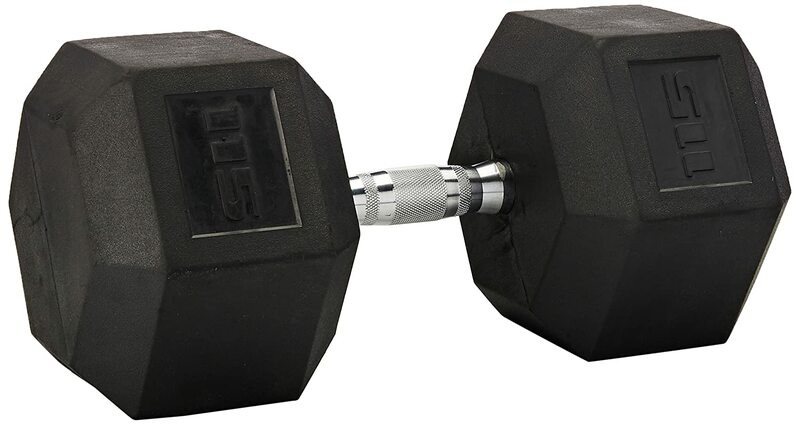 The only thing that really bothers me about these rubber hex dumbbells is that they don’t have a uniform shaft length. This is common of most dumbbells, however the Titan Fitness dumbbells have a big variation in length. The length difference can throw off your balance and take some getting used to. Who It’s For: Beginners who want a good deal on a complete rubber hex dumbbell set. When it comes to dumbbells, what really matters is that you are actually putting them to use. However, experienced lifters know that the type of dumbbell can impact your workout. 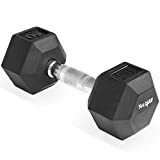 This doesn’t mean you have to spend a fortune on expensive rubber hex dumbbells to get results – but you should be aware of certain dumbbell features to make sure you are getting the best product available for your budget. 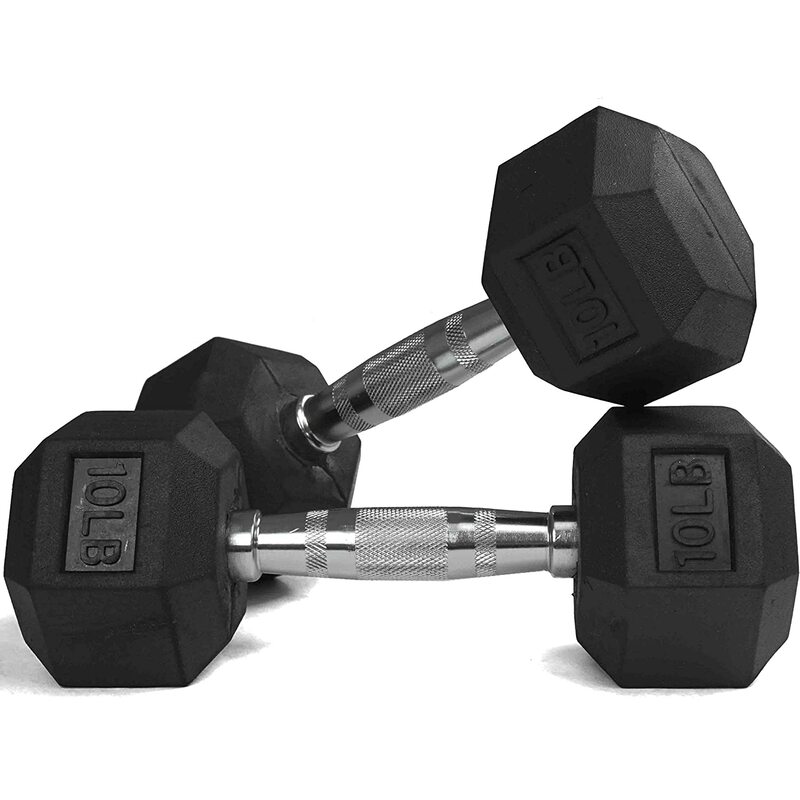 Pay careful attention to what the shafts are made of when buying rubber hex dumbbells. While the rubber will protect the weighted ends of the dumbbell against rust, it won’t protect the shaft. In general, the best shaft choice is coated chrome. This material resists rust, won’t crack, and has a nice shiny look. All of the best rubber hex dumbbells which made our list have coated chrome shafts. The best dumbbells are made by solid casting. This means that the iron is poured into a mold so it is one single piece. By contrast, cheaper dumbbells are made by welding the shaft onto the weighted ends. Solid-cast dumbbells are less likely to crack or break because they don’t have any weak points. This isn’t too much of an issue with lighter dumbbells. 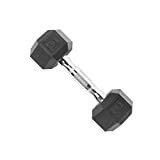 However, if you are buying heavier dumbbells or plan on dropping the dumbbells, then you’ll want to choose solid-cast ones. A lot of people think they only need the one dumbbell since they plan on only doing single circuit dumbbell exercises like dumbbell snatches or goblet squats. However, a lot of people later regret buying just the one dumbbell because they can’t do exercises like overhead presses or bent-over rows. Remember that the shipping costs of dumbbells can be quite high. 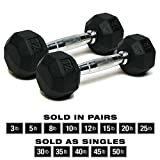 So, even if you don’t think you’ll need a pair, it is often worth it to buy a pair of dumbbells right away so you save on shipping. We talk about this in our post about the difference between hex and round dumbbells. I won’t reiterate everything said there, but you should know that hex dumbbells won’t roll. This makes them safer (no crushed toes!) and suitable for exercises like dumbbell pushups. 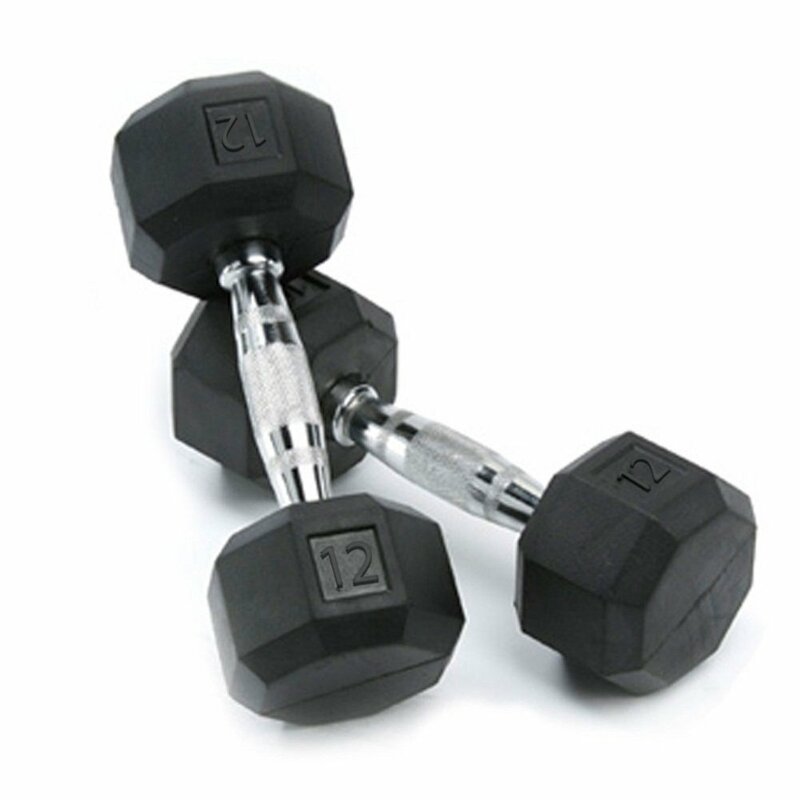 Rubber dumbbells are made out of cast iron which has been coated with rubber. The rubber coating means the dumbbells will cost more, but virtually all lifters will agree that the extra cost is worth it because the pros outweigh the cons. Check out rubber hex dumbbell reviews and one of the biggest complaints you’ll read is that they stink. If you make the mistake of opening your rubber dumbbells in the home, it can cause a stink which permeates for days. Leave the Rubber Dumbbells Outside: If you aren’t in a rush, just put the dumbbells outside so the bad smell can naturally dissipate. Sunlight also helps the rubber finish gassing off. Wash ‘em: Use PineSol or Murphy’s Oil soap to wash the rubber. It will help get rid of the smell and also any oily residue. Kitty Litter + Baking Soda: One good way to get rid of the rubber stink is to cover the dumbbells with a mixture of kitty litter and baking soda. Both of these substances are very absorbent and will soak up the bad smell. Clean the rubber part of the dumbbells by wiping them with dish soap + water and then drying them with a clean cloth. Clean the chrome handles by applying a thin layer of WD40 and then wiping them down so they aren’t slippery. The WD40 will protect them against rust. 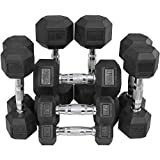 Of all the top rubber hex dumbbells listed, I’d say that the dumbbells by Yes4All are the best option. They have a good grip, are well-made, come in 5lb weight increments, and are a good value. If you don’t mind paying a bit more though, the SPRI rub dumbbells are great because of how many weight options they have. Just remember, you have to actually use your dumbbells to get results. Get your home gym set up so you can get the results you want!